Congratulations to Boardman’s Mackenzie Riccitelli for being chosen as the MVP of the Cleveland Cavaliers Academy Youth Basketball Camp. Mackenzie was chosen from 75 girls and boys who attended the camp today held at Boardman High School. 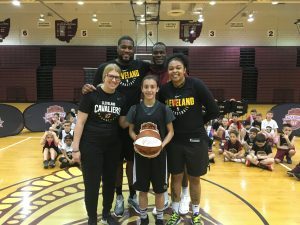 She received an autographed Cavaliers basketball signed by Larry Nance Jr. She was chosen not only for her athletic ability and hard work, but for exemplifying what the Cavaliers look for in today’s youth. Mackenzie will be entering the 8th grade next fall at Glenwood Junior High. She was on the Glenwood 7th grade girls basketball team this winter. Her father, high school girls assistant basketball coach Donny Riccitelli helped run the clock today for the Cavaliers and was one proud father of his daughter’s accomplishments today! Congratulations again Mackenzie.